ECFMG employee Ryan Hall recently traveled to Johannesburg, South Africa, as a participant in the Temple University School of Media and Communication 2014 South Africa Study Away Program. Hall was one of 11 Temple students to complete the four-week program, which was set up as an elective course in foreign journalism to mark the 20th anniversary of the end of apartheid. Students spent the first two weeks of the course learning from local experts, who gave presentations and led them on various field trips aimed at enhancing their understanding of South African society. The second half of the course was devoted to individual research projects, and required students to conduct reporting and research in and around Johannesburg. 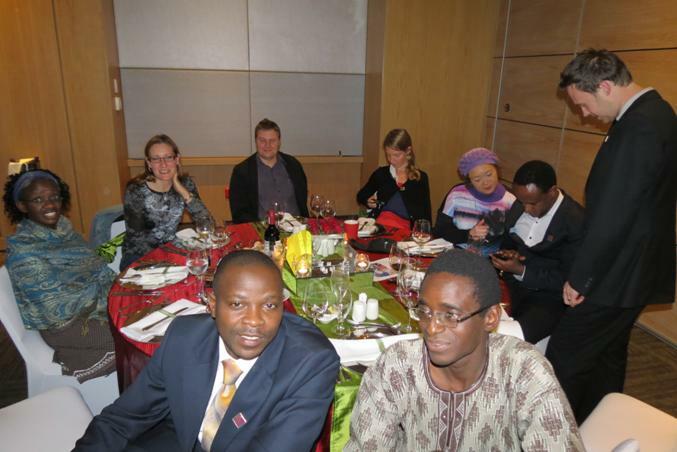 A dinner was held to mark the five-year anniversary of the Southern Africa-FAIMER Regional Institute (SAFRI) on June 29, 2013, at the Gateway Hotel in Durban, South Africa. Fifty-eight guests attended, including representatives from FAIMER, the South African Association of Health Educationalists (SAAHE) Council, deans of universities, and SAFRI Faculty and Fellows. Notably, Fellows representing each of the years of SAFRI’s existence (2008-2013) were in attendance. Former SAFRI Co-Director Juanita Bezuidenhout served as the evening’s master of ceremonies. She welcomed everyone and gave the first speech, followed by speeches from FAIMER President John Norcini and former SAFRI Co-Director Vanessa Burch. SAFRI program leadership was officially handed over to new Co-Directors Dianne Manning and Jacqueline van Wyk. Corne Postma (SAFRI 2011) gave a speech on behalf of the SAFRI Fellows. At the end of the evening, some of the Fellows expressed their appreciation and joy by treating attendees to some impromptu dancing. For more on the anniversary dinner and other SAFRI news, visit http://safri.faimerfri.org/wp-content/uploads/2013/09/SAFRI_NEWSLETTER_AUGUST2013.pub_.pdf. The Fifth National Conference of the South African Association of Health Educationalists (SAAHE) took place June 21-23, 2012, in the central South African city of Bloemfontein. As in previous years, Fellows and faculty from the Southern Africa-FAIMER Regional Institute (SAFRI) made significant contributions. Of the 129 presentations in the parallel sessions, 32 oral and 20 poster presentations (approximately 40% of the total) were made by Fellows or faculty members. There were an additional 35 co-authorships and six chaired sessions by FAIMER Fellows. The SAFRI program requires all second-year Fellows to submit an abstract of their education innovation project to SAAHE for a proposed poster or oral presentation. All of these submissions were accepted by the conference. FAIMER faculty member Janet Grant of CenMedic in the United Kingdom was the FAIMER-sponsored invited speaker. She delivered two inspiring plenary addresses: “Apprenticeship in the Era of Confidence” and “Working and Learning in the Service—Managing Continuing Professional Development.” Dr. Grant also conducted a conference workshop on diagnostic thinking. Once again SAFRI Fellows were prominent in the poster prizes with Lakshini McNamee (SAFRI 2009), who was advised by SAFRI Co-Director Juanita Bezuidenhout (PHIL 2005), and Paula Barnard-Ashton (SAFRI 2011), who was advised by FAIMER faculty member Di Manning (PHIL 2008), named as the two runners-up. The conference ended with an invitation from Veena Singaram to attend the sixth national SAAHE meeting in June 2013. Dr. Singaram is chair of the organizing committee and yet another FAIMER Fellow (SAFRI 2008).